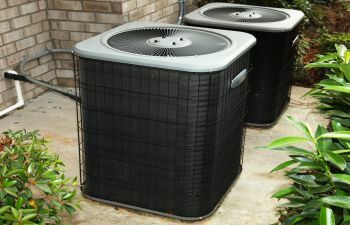 While it may appear that HVAC would have no connection to the world of electrical repair, these fields are very much connected, as heating and cooling units rely upon electricity to run smoothly and effectively. Therefore, HVAC specialists have extensive knowledge of electrical components, how they relate to each unit and how to repair them. Given that May is National Electrical Safety Month, there’s no better time to learn how to recognize and prevent HVAC electrical problems. Did you know? The majority of HVAC problems are related to an electrical breakdown. For instance, consider a capacitor, which regulates power to an HVAC unit and keeps it going. As a common HVAC electrical concern, a faulty capacitor can cause a number of electrical problems. Whether due to excess voltage or normal wear and tear, when a capacitor fails to work properly, it will need to be replaced to restore the HVAC unit. Also caused by wear and tear, loose wiring can affect the amount of power transmitted to an HVAC unit. While the unit itself becomes impaired as a result, loose wiring poses a risk to home and business owners, and may cause fire. On the other hand, when an HVAC system demands too much power, circuit breakers might trip from overload. It’s important to understand that when a circuit breaker trips every once in awhile, it is usually an easy fix, and doesn’t require assistance from a professional electrician. Even so, when the breaker continually trips, it might be because it doesn’t fit well or that it is loose. In this case, it’s a good idea to call a certified electrician. Given the above-mentioned HVAC electrical concerns, you might be wondering, “how will I know there’s a real problem with my unit?” First, pay attention to your HVAC and electric bill. If it goes up without any changes in usage, there might be a problem. In turn, consider the amount of moisture in your home. If the air is too humid or too dry, or if certain areas of your home feel warmer or cooler than others, this could signal an electrical failure. Finally, if components of your HVAC system are more than 10 or 15 years old, and you begin to notice inconsistencies in how the unit operates, it’s a good time to call in the professionals. When home and business owners in Alpharetta and surrounding areas need quality HVAC maintenance and repair, as well as insight into any electrical concerns, they turn to the specialists at ClimateSmith, LLC. With high recommendations and multiple super service awards, the technicians at ClimateSmith are licensed and insured HVAC professionals that you can trust.